And painting Wil Wheaton and herself in cheesy romance cover style art for "Team Cawkes." 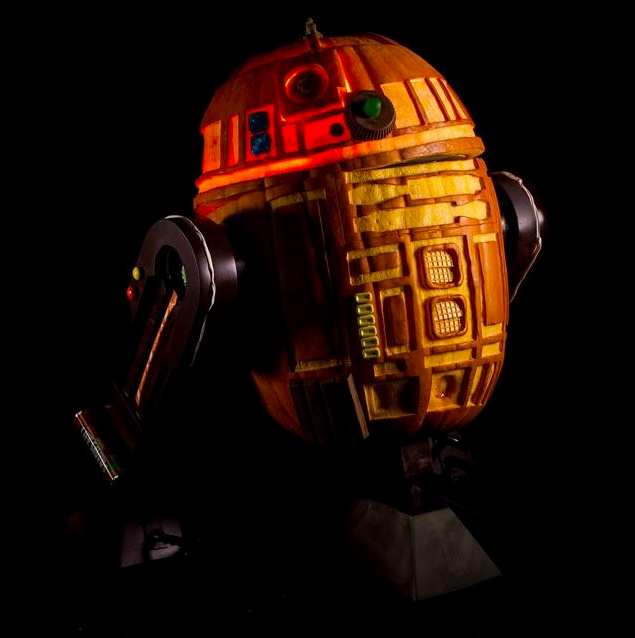 Even last week, Geek & Sundry challenged me to create the ultimate Halloween Jack o' lantern, so I made a radio controlled R2D2 out of a pumpkin! (A) Topics: Your favorite geeky things! It could be as specific as a character, prop, location, vehicle, robot, or animal, or as general as the title of a movie, comic, show, or book! Anything you would want to see me build from all of geek lore! 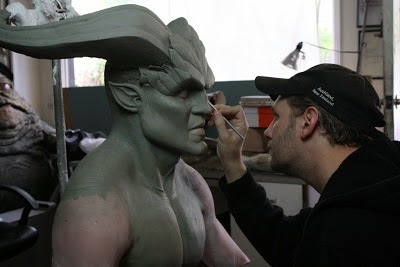 (B) Mediums: You have all seen me use clay, plastics, and resins before. This is where the challenge comes in! Name the craziest material you can think of, and dare me to build something out of it. It can be ANYTHING! I won't even give any suggestions. I want your imaginations to run wild! Here's the catch: All of your suggestions will be mixed up and one from each category will be randomly chosen. Whatever that combo is will be what I have to build! Love this idea, good luck Greg! - Continuing a holiday theme, a gingerbread Gotham cityscape (Tim Burtonesque), maybe a Batmobile roaring down the frosting-snow-covered streets. - An Autobot made of old tires. (Old school or Bay-school, depending on difficulty you'd wanna go for). - A Star Trek phaser pistol or rifle made of unchewed Fruit Stripe Gum. - An Incredible Hulk maquette made from green tea leaves. - A large model of a fragmenting TRON Legacy lightcycle made from ping-Pong balls, glue and wire. - A Tony Stark bust made of Iron Man stuff (magazines, images, toys, shirts, other themed merchandise.). - A Gollum made of sardines (2-D or 3-D, whatever tolerable level of challenge). - A Vorlon made of bailing wire. - Mix and match objects and materials previously mentioned. Maybe withdraw a material from a hat, and an object from a hat, heh.